While other towns and cities in Bicol enjoy throngs of tourist arrivals, this capital town that serves as gateway of the region from the rest of Luzon is frequently off travelers’ list mainly because of a dearth in local tourism promotion. Admitting this sad fact and vowing to come up strong, the municipal government recently launched “Visit Daet”, a program expected to lure tourists into coming to the place that boasts of rich cultural heritage, generally warm and friendly people, mouth-watering delicacies and eco-tourism wonders. Virtually underrated and rarely visited by most travelers, Daet hides its spectacular secrets of exquisite and unspoiled postcard-perfect beaches and rich coral gardens, promising dive sites and world-class surfing, elegant looking bays that open into the Pacific, misty mountains and charming towns throbbing with Bicolano warmth and hospitality – all of this under a veneer of quiet, genteel simplicity. Only about seven hours by bus southeast of Metro Manila, the municipality tends to get overlooked by travelers to the popular wakeboarding in Pili, Camarines Sur and island hopping in the Survivor islands of Caramoan, the perfect cone of Mt. Mayon in Legazpi City and the whale sharks of Donsol, Sorsogon. Added to these are the wet and wild Pacific frontier province of Catanduanes that is home to one of the most famous international surf breaks called the Majestics and Masbate City that takes pride of having enormous fish sanctuaries that is home to the exciting manta rays. But why leave out Daet when it had the Bagasbas Beach, which is also a known surfboarding ground and kite-boarding venue that is site of the yearly International Kiteboarding Competition since 2009. 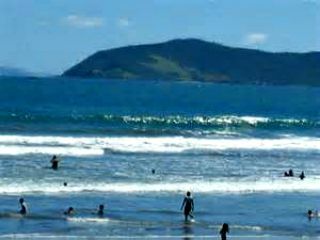 The beach has a long and wide expense of fine gray sand and during clear but windy days, its waves that roll-in from the Pacific Ocean make it a paradise for surfing beginners and aficionados. It is considered as one of the most beautiful beaches in the country. Locals claim that Bagasbas is the real cradle of Philippine surfing. Having the surfer ambience going on, Bagasbas has a very laidback feel, the shacks of restaurants and karaoke bars and tiny backpacker resorts line a tiny strip fronting the beach. Altogether, Bagasbas was an awesome place. About 20 minutes on motorized boats from Bagasbas is the Malasugui Island, which is part of the gorgeous Mercedes Group of Islands that surprises visitors how beauties like these have been kept from the national tourism spotlight for so long. While boasting of coral gardens, rich and teeming with huge and healthy coral growth and marine fauna, the island group has the dramatic lighthouse on Canimog Island which is considered to be the oldest in Bicol. By the lighthouse, one could have sweeping views of the Pacific Ocean, the beautiful cliffs and rock formations, as well as an eye on the thousands of huge bats literally hanging out in the island’s lush foliage. Being the provincial center, most of the province’s hub of commercial, political, religious and educational activity is in this town where the people are generally friendly and warm. The first Jose Rizal monument that was ever built is here standing at the corner of Magallanes and Justo Lukban streets, facing the Daet Municipal Hall. This monument was erected in 1898 in honor of the Philippine National Hero and consists of a three-tiered stone pylon with a square base supporting a triangle in two stages, the last one tapering to a point. It was believed that the foundation was made of mortars and boulders from the Old Spanish Jail, where many Filipino patriots died, further magnifying its historical and cultural significance. It was inaugurated on Dec. 20, 1898. A few meters away from the Rizal monument is a wall honoring the brave sons of Camarines Norte, who died fighting the Spaniards during the country’s fight for independence. No less than 13 martyrs were contributed by this community before the altar of liberty. They were butchered before burned alive by the Spaniards and buried in a common grave on Easter Sunday, April 1898. Aside from monuments, Daet is proud of their Provincial Capitol whose 12 columns represent the 12 towns of the province. The provincial complex, where it sits, is also home to the Museo Bulawan which provides a window into the province’s rich history and culture. “Visit Daet” has lined up various activities for the rest of this month that Mayor Tito Sarion over the weekend described as “a sort of a long fiesta” where the municipality is showcasing its gains from its great history, culture, customs and economic potentials. It is also showing off distinctive local products and the beauty of the place as a tourist destination. Under this program, Sarion said: “We are doubling our time so that we are able to catch up with the rest of Bicol’s tourism areas. We also have beautiful places that a person with the spirit of adventure would truly appreciate”. Lined up for the “Visit Daet” program are the awarding to the municipality’s Outstanding Senior Citizen that gives recognition to the contributions of the elderly sector to local governance and economic undertakings and the Municipal Council Conference for the Protection of Children that would lay down measures for the welfare of the younger generation. Included in the activities are the simultaneous barangay assemblies, the Gawad Kalinga Daet Enchanted Farm Commitment Ceremony, State of the Children Report, the Pro-Daet River Day, inauguration of Water Lily Production Center and Business Plan Competition. It will also stage and the First Daet Trike Expo, an activity that would affirm this town’s popularity as the locality with the biggest number in Southern Luzon of tricycles serving the short distance transportation needs of the public. The program will capped by the commemoration of the erection of First Rizal Monument and the launching of the book on it. “And should travelers and tourists miss in Albay or in the nearby Camarines Sur the famous Bicol delicacies, we are more than willing to treat them to the authentic and absolutely delectable Bicol Express, Tuna Express, Sinantol (dish made from santol fruit), Laing and Kinunot,” Sarion said.